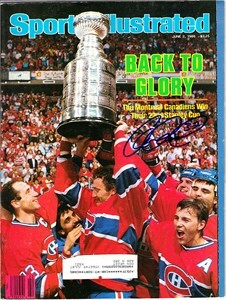 Original complete June 2, 1986 Sports Illustrated featuring the Montreal Canadiens Stanley Cup celebration, autographed in blue marker by former star right wing Claude Lemieux, who as a rookie led the team with 10 playoff goals, 4 of them game winners. Obtained in person. With certificate of authenticity from AutographsForSale.com. Has minor wear but in excellent condition for its age. ONLY ONE AVAILABLE FOR SALE.